A few years ago I came across this book, an entire book of vegan cupcake recipes. This intrigued me because I was interested to see how well a cupcake would turn out with no eggs or milk. Honestly, I didn't think they would be very good...they'd be too dry or dense. But I'm never one to turn down a cupcake so I bought the book and headed to the grocery store to pick up a few ingredients. For the next couple of months I baked a different kind of cupcake every week. And you know what? They all turned out delicious. Since I was making so many cupcakes I would share them with pretty much anyone who wanted to try them. Unfortunately, I know people who would not try these cupcakes if I told them that they were vegan cupcakes. So I tricked those people into eating them. They were all shocked to learn that the dessert they were going back for thirds and fourths for were vegan. There is quite the variety of cupcakes recipes in this cookbook. They range from your basic chocolate or vanilla cupcake to a banana split cupcake to a s'mores cupcake to green tea cupcakes to coconut lime cupcakes. Plus there are recipes for vegan frosting. Is your mouth watering yet? The peanut butter cupcakes are a personal favorite, I've made those multiple times. However, I do have one gripe about this book. It lies. There are not "75 dairy-free recipes for cupcakes". I counted. There are only 39 cupcake recipes. Then there are an additional 14 recipes for frosting or glaze. 39 + 14 = 53. So where are the other 22 recipes?? I'm thinking the authors are counting the variations listed at the end of some of the recipes. That disappointed me a little, I was looking forward to 75 original recipes. Overall, this is a great book filled with amazing cupcake recipes. If want to make a batch of vegan cupcakes or just try a new recipe (apple cider cupcakes anyone? ), then this book is a great place to start. Thinking about cupcakes is making me uber hungry. I never thought of vegan cupcakes. Hmmm... Maybe I should. Ahh those sound so yummy! The house I live in has some vegans, so I've had vegan brownies and cookies a couple times, but I don't think I've had vegan cupcakes yet. I'll have to try that (or...have someone else try that because I'm more of an eater than a baker)! I will post the apple cider cupcake recipe shortly! Yes! I did a review a few months ago of some Vegan cookbooks, including Vegan Cookies Invade Your Cookie Jar (yum!) and Veganomicon (yum yum). Happy baking! 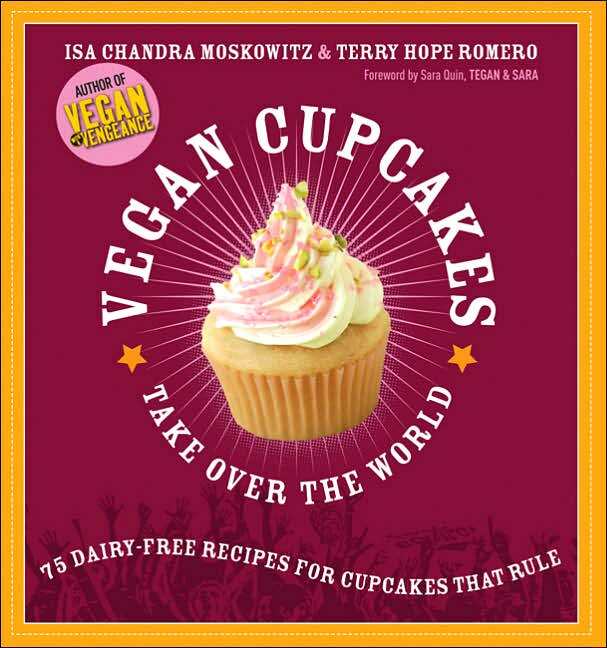 I think it is funny that they stretched the number of vegan cupcakes, but at the same time, books like this completely overwhelm me - too many cupcakes, too little time, too little sweet tooth. Anyway, as a vegan I can say that baked goods are not something I miss because I don't have to - vegan baking makes for some super tasty desserts. Haha. This is awesome! I would definitely try a vegan cupcake.. mostly because a former roommate of mine was vegan, and she made some AWESOME vegan cookies, so I wouldn't be "afraid" to turn anything vegan down, now!!! Great review! I'm going to let my friend know about this book. Her son is allergic to almost everything under the sun (poor baby) and one of those things is all things dairy. It will be his first birthday coming up, and she was sad that he wouldn't be able to have a treat. Now he will! Thanks! I found Vegan Cookies Invade Your Cookie Jar today at the library and checked it out! Very excited to make the Pumpkin Pie Brownies. Amanda, I hope your friend finds a recipe for her son's birthday! Tahleen, you'll have to let me know how the cookies turn out! This and Vegan Cookies Invade Your Cookie Jar are fantastic! I use them to avoid food allergies. I can feed the final products to pretty much anyone and they are always a hit!